45-year-old Srinivasa was a farmer. 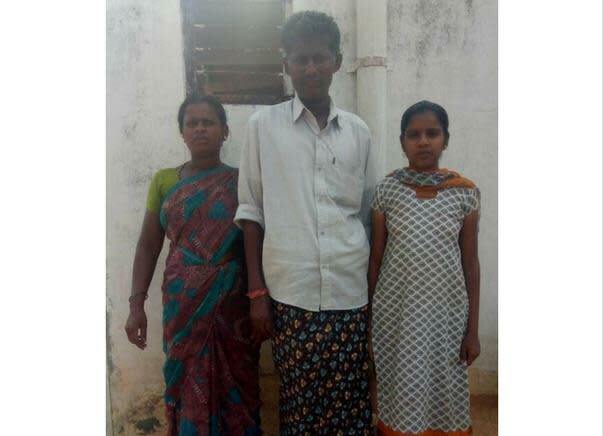 He worked on his 1 acre land to fend for his wife Rathnamma, who lost her voice post a heart surgery a couple of years back, and his daughter who has just finished her 12th standard public exams. It was around a year back that Srinivasa developed a pain in is tongue and had great difficulty chewing and swallowing his food. Thinking of it as ulcers, he consulted a local doctor. This was only the beginning of many trips to many doctors in a desperate attempt to get some relief from the pain. His speech was slowly getting impaired as well. A biopsy finally threw light on the diagnosis: Srinivasa had tongue cancer. Srinivasa sold his land and started working on daily wage on other people's land. He started going for chemotherapy. Soon, a surgery caused him to quit his work as well. He somehow continued educating his daughter. He had spent most of what he had on his wife's treatment a couple of years ago, and had no savings to draw down. 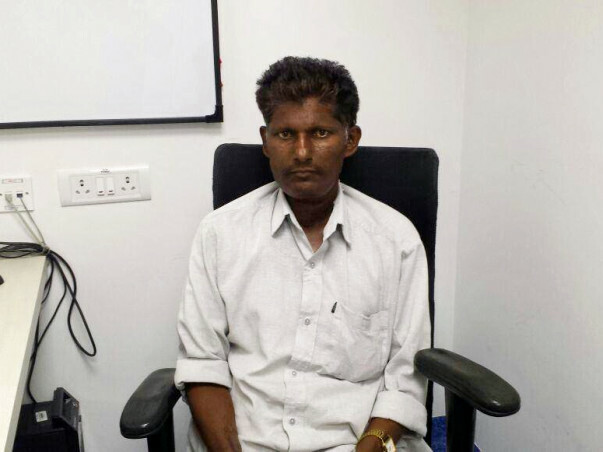 "In the past one year Srinivasa has already undergone 3 cycles of chemo, 36 radiations and 2 surgeries: 1 to remove the part of his tongue affected by cancer, and another, a plastic surgery to rectify the same. Right now, they don't even have money in the house for food, and he has borrowed some money on interest from village money lenders, " says Venkatesh, Srinivasa's friend from the same village, who is a helper in a hospital and has been helping him in any little way possible. Srinivasa has been fighting this battle boldly, all by himself. 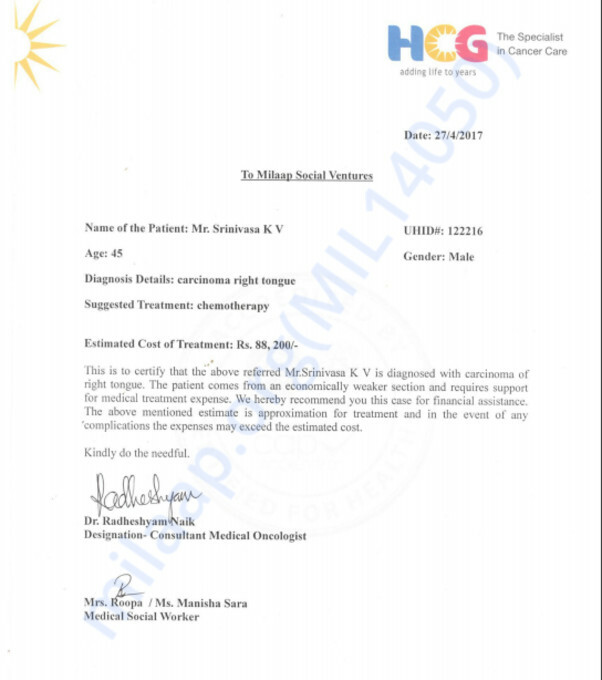 With your help, he will be able to continue his chemotherapy and live for his wife and daughter. srinivas completed his 4th cycle of chemo as well.. He is taking only regular check ups now. thank you all for the support. 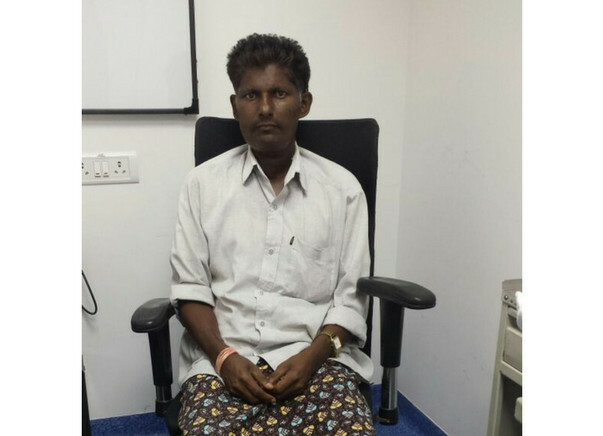 Srinivas has undergone his first chemotherapy on 28th April 2017, second chemo on 8th May 2017 and third chemo on 15th May 2017. His Bill came almost around 38,000. He is looking for more funds from donors as his 4th cycle of chemo is due last week.